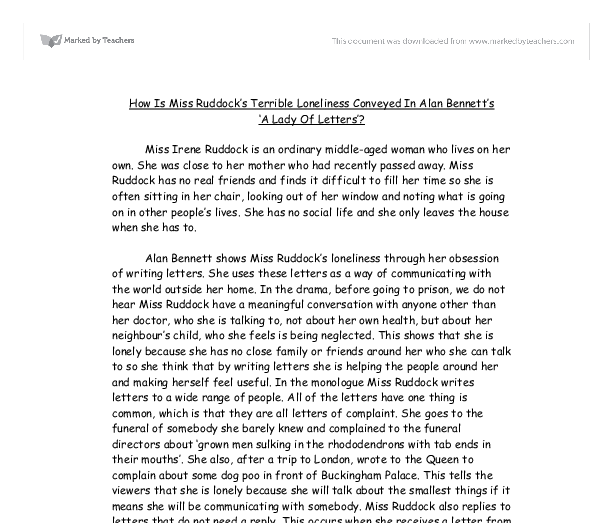 How Is Miss Ruddock's Terrible Loneliness Conveyed In Alan Bennett's 'A Lady Of Letters'? Miss Irene Ruddock is an ordinary middle-aged woman who lives on her own. She was close to her mother who had recently passed away. Miss Ruddock has no real friends and finds it difficult to fill her time so she is often sitting in her chair, looking out of her window and noting what is going on in other people's lives. She has no social life and she only leaves the house when she has to. 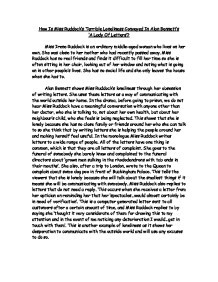 Alan Bennett shows Miss Ruddock's loneliness through her obsession of writing letters. She uses these letters as a way of communicating with the world outside her home. In the drama, before going to prison, we do not hear Miss Ruddock have a meaningful conversation with anyone other than her doctor, who she is talking to, not about her own health, but about her neighbour's child, who she feels is being neglected. This shows that she is lonely because she has no close family or friends around her who she can talk to so she think that by writing letters she is helping the people around her and making herself feel useful. In the monologue Miss Ruddock writes letters to a wide range of people. All of the letters have one thing is common, which is that they are all letters of complaint. ...read more. Throughout the monologue there is very little communication with the outside world. Instead of getting to know a person, she makes stereotypical assumptions, which backfire on her when she complains about a neighbouring family neglecting their son, leaving him in the house on his own when they go out. She is later informed by police that he was in hospital, and had died from Leukaemia. Before Miss Ruddock goes to prison the viewers learn that she is obsessed with trivial thing. She has no friends and nothing to do so she becomes obsessed. This is shown on one of many occasions when she is sitting in her chair looking out of her window. She is looking at her neighbours house when she states that, while they are having their tea, there is 'no cloth on'. Miss Ruddock is also very critical of hygiene. In one instance while on a day trip to London she notices that a 'dog had gone and done its business right outside Buckingham Palace'. After seeing this she writes a letter to the Queen to complain about it. I think that these two examples show that Miss Ruddock suffers from loneliness as although many people write to the Queen, very few do so to complain about trivial issues, like the amount of dog poo on the streets of London. After spending time in prison Miss Ruddock is a changed person. ...read more. 'We are trying to put a letter together to her boyfriend. Well she says it's her boyfriend only I had to start the letter three times due to the fact that she could not remember his name'. Miss Ruddock carried on writing even though she knew it was not true as she thought it would make life in prison seem easier for her new friend. Since going to prison Miss Ruddock has ceased writing useless letters. This may be due to her learning her lesson but since going to prison Miss Ruddock has had more things with which to occupy her time. 'I am that busy ... I've opted for bookbinding and dressmaking'. With these things she has had no time with which to write letters and she has nothing to complain about. The viewer also knows she is lonely as her last words in the monologue are 'I am so happy.' For most people prison is the worst time of their lives but prison gave Miss Ruddock a new license of life and now she has so little time for herself and feels so wanted and needed she loves life. I think that when Miss Ruddock is released from prison she will not continue to write letters. I think that, for most people the story had a sad ending, but Miss Ruddock learned a lot from prison, it helped her to overcome her 'terrible loneliness' by making her feel she had a purpose. It also taught her how to communicate with people orally, and how to make friends. Jamie Russell 11.4 ...read more. This student written piece of work is one of many that can be found in our GCSE Alan Bennet section. and feelings; particularly as when the background story is fully revealed and the reader is right at the heart of what is really happening. We are the first to know about Stuart's alibis being misleading, his real preference for whether Tina is ever let off the lead, and finally when the slacks are found, removed then replaced, we know. Many opposed her ideas and Alan Bennett rebelled in a smart way by showing how bad life was for Miss Ruddock when she was following Margaret Thatcher's sayings and when in prison she socialises a lot and becomes part of community, something Margaret Thatcher was against. How does Alan Bennett maintain the audiences interest in A Lady of Letters? This feeling will make it feel personal to the audience and will also add to their appreciation of Miss Ruddock. Also, this is Bennett's way to convey the idea that we are losing the respect for elder people and the sense of 'close-knit' communities that were present in previous generations. "When mother died I had fifty-three letters"; this suggests that other people only acknowledged and contacted Irene when her mother died, so she sought more comfort in letters. The reader pities Irene as now her mother is not in her life anymore she feels socially isolated and is still seeking assurance in letters. How believable did you find the transformation of Miss Ruddock in Prison? This is a mix of comedy and tragedy, both in different ways. There is the surface of comedy from the bathos, created by 'fat girl'. This is funny because of the girl has suddenly become fat because she's hosting the cast.